The Haggadah (Hebrew: הַגָּדָה‎, "telling"; plural: Haggadot) is a Jewish text that sets forth the order of the Passover Seder. Reading the Haggadah at the Seder table is a fulfillment of the Scriptural commandment to each Jew to "tell your son" of the Jewish liberation from slavery in Egypt as described in the Book of Exodus in the Torah ("And thou shalt tell thy son in that day, saying: It is because of that which the LORD did for me when I came forth out of Egypt." Ex. 13:8). Sephardi and Mizrahi Jews also apply the term Haggadah to the service itself, as it constitutes the act of "telling your son." The Mishna details questions one is obligated to ask on the night of the seder. It is customary for the youngest child present to recite the four questions.Some customs hold that the other participants recite them quietly to themselves as well. In some families, this means that the requirement remains on an adult "child" until a grandchild of the family receives sufficient Jewish education to take on the responsibility. If a person has no children capable of asking, the responsibility falls to the spouse, or another participant. The need to ask is so great that even if a person is alone at the seder he is obligated to ask himself and to answer his own questions. Shebb'khol hallelot anu okh’lin ḥamets umatsa, vehallayla hazze kullo matsa. Shebb'khol hallelot anu okh’lin sh’ar y'rakot, vehallayla hazze maror. Shebb'khol hallelot en anu matbillin afillu pa‘am eḥat, vehallayla hazze sh'tei fe‘amim. Shebb'khol hallelot anu okh’lin ben yosh’vin uven m'subbin, vehallayla hazze kullanu m'subbin. 5. Shebb'khol hallelot anu okh’lin basar tsali shaluk umvushal, vehallayla hazze kullo tsali. The traditional Haggadah speaks of "four sons"—one who is wise, one who is wicked, one who is simple, and one who does not know to ask. This is based upon the rabbis of the Jerusalem Talmud finding four references in the Torah to responding to your son who asks a question. Each of these sons phrases his question about the seder in a different way. The Haggadah recommends answering each son according to his question, using one of the three verses in the Torah that refer to this exchange. The wise son asks "What are the statutes, the testimonies, and the laws that God has commanded you to do?" One explanation for why this very detailed-oriented question is categorized as wise, is that the wise son is trying to learn how to carry out the seder, rather than asking for someone else's understanding of its meaning. He is answered fully: You should reply to him with [all] the laws of pesach: one may not eat any dessert after the paschal sacrifice. With the recital of the Ten Plagues, each participant removes a drop of wine from his or her cup using a fingertip. Although this night is one of salvation, the sages explain that one cannot be completely joyous when some of God's creatures had to suffer. A mnemonic acronym for the plagues is also introduced: "D'tzach Adash B'achav", while similarly spilling a drop of wine for each word. At this part in the Seder, songs of praise are sung, including the song Dayenu, which proclaims that had God performed any single one of the many deeds performed for the Jewish people, it would have been enough to obligate us to give thanks. After this is a declaration (mandated by Rabban Gamliel) of the reasons of the commandments of the Paschal lamb, Matzah, and Maror, with scriptural sources. Then follows a short prayer, and the recital of the first two psalms of Hallel (which will be concluded after the meal). A long blessing is recited, and the second cup of wine is drunk. However the Malbim, along with a minority of commentators, believe that Rav and Shmuel were not arguing on its compilation, but rather on its interpretation, and hence was completed before then. According to this explanation; the Haggadah was written during the lifetime of Rabbi Yehudah HaNasi,[note 4] the compiler of the Mishna. The Malbim theorizes that the Haggadah was written by Rav Yehudah HaNasi himself. The earliest Ashkenazi illuminated Haggada is known as the "Bird's Head Haggada", now in the collection of The Israel Museum in Jerusalem. The Rylands Haggadah (Rylands Hebrew MS. 6) is one of the finest Haggadot in the world. It was written and illuminated in Catalonia in the 14th century and is an example of the cross-fertilisation between Jewish and non-Jewish artists within the medium of manuscript illumination. In spring and summer 2012 it was exhibited at the Metropolitan Museum of Art, New York, in the exhibition 'The Rylands Haggadah: Medieval Jewish Art in Context'. 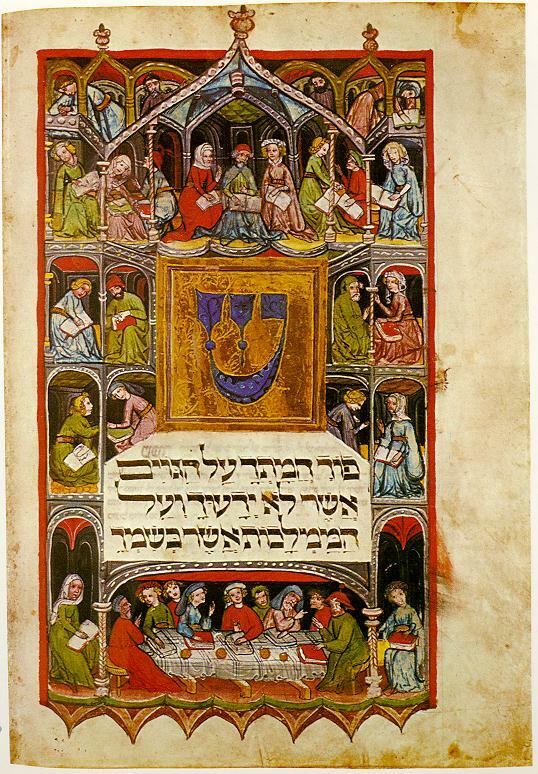 The British Library's 14th century Barcelona Haggadah (BL Add. MS 14761) is one of the most richly pictorial of all Jewish texts. Meant to accompany the Passover eve service and festive meal, it was also a status symbol for its owner in 14th-century Spain. Nearly all its folios are filled with miniatures depicting Passover rituals, Biblical and Midrashic episodes, and symbolic foods. A facsimile edition was published by Facsimile Editions of London in 1992. Published in 1526, the Prague Haggadah is known for its attention to detail in lettering and introducing many of the themes still found in modern texts. Although illustrations had often been a part of the Haggadah, it was not until the Prague Haggadah that they were used extensively in a printed text. The Haggadah features over sixty woodcutillustrations picturing "scenes and symbols of the Passover ritual; [...] biblical and rabbinic elements that actually appear in the Haggadah text; and scenes and figures from biblical or other sources that play no role in the Haggadah itself, but have either past or future redemptive associations"
The works produced in the Bezalel School of Art and Crafts in Jerusalem during its first phase (1906-1929) are usually classified according to the material and technique employed in their making. 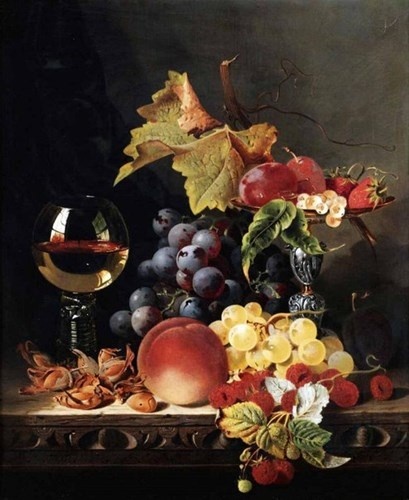 In analyzing the objects, greater emphasis is given to questions of style, whereas the iconography is discussed in broad generalizations or linked with stylistic aspects. 2 Setting aside questions of style or function, however, the works produced at Bezalel reveal that biblical themes played a considerable part; but this is by no means obvious. With regards to activity in the field of Jewish art in Europe at the time of Bezalel's foundation, and the later developments in Jewish art in Eretz Yisrael since the 1920s, it seems fairly clear that the recurrence of biblical subjects in Bezalel art is in fact exceptional. Since the iconography of Bezalel has been very little explored, this phenomenon has been overlooked. 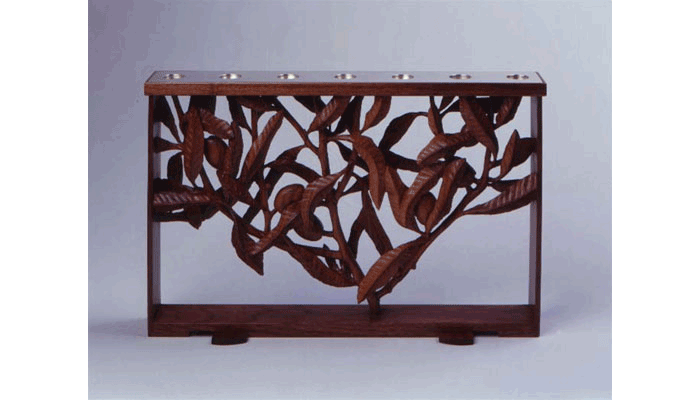 3 This is partly due to the nature of Bezalel products, which are classified as decorative art and handicrafts, and are thus traditionally discussed in terms of form and quality of execution, rather than in terms of subject matter. 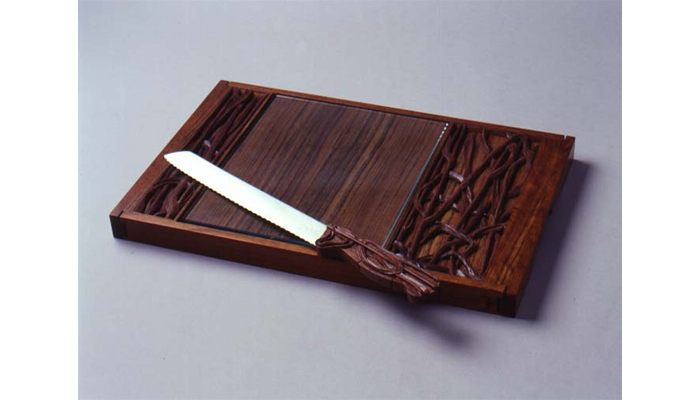 Since Bezalel was not merely an art school accompanied by workshops, but rather an organized enterprise that aimed at national and cultural goals, the study of the subject matter of its artistic products may offer a further insight into the purpose and meaning of these works and of the Bezalel project in general. Generally speaking, no conflict, war, disaster or negative aspect of biblical life are depicted, with the exception of the selling of Joseph and the Expulsion from Eden, both of which are rare. Even the depiction of the Akedah (The Binding of Isaac) is rare. Also rare are themes that involve contact between humankind and the divine, such as meeting with angels..
From the very beginnings of the Bezalel enterprise, there was a conscious effort to create a new and unique "Hebrew" style of art. Bezalel students and artisans sought inspiration in the native flora and fauna, notably the palm tree and the camel. They referenced archeological treasures, replicating Judean coins in filigree pieces and utilizing ancient mosaic floor designs in the carpet workshop. Traditional Jewish symbols such as the six-pointed Star of David and the seven-branched menorah were especially popular, as were architectural icons of the Holy Land. Biblical heroes, "exotic" Jewish ethnic types, modern halutzim (pioneers), and Zionist luminaries were also common subjects. Perhaps the most innovative "Hebrew" artistic creation of the Bezalel School was the decorative use of the letters of the Hebrew alphabet. 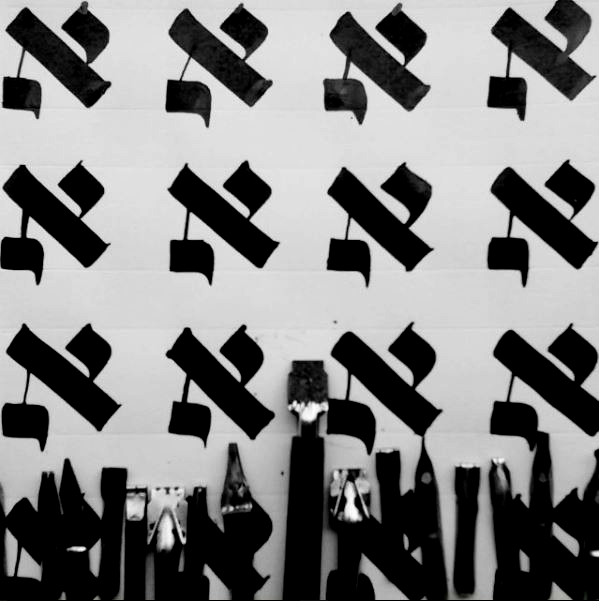 Influenced both by Art Nouveau European typography and Islamic calligraphy, Hebrew letters served as a distinct decorative motif found on nearly every object created at Bezalel. This elaborate silver binding is the work of the two most renowned artists of the Bezalel School, Ze'ev Raban and Meir Gur-Arie. 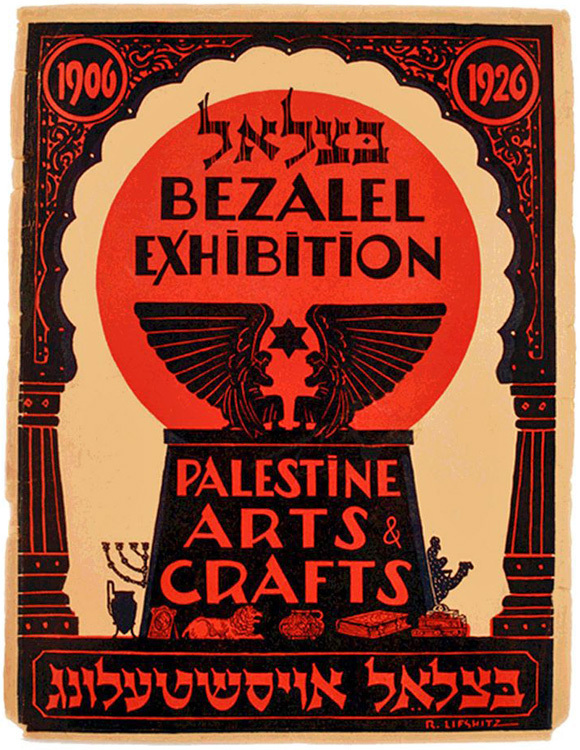 In addition to teaching at Bezalel, the two founded the Industrial Art Studio in 1923, which continued to operate after the closing of the school in 1929. Three ivory medallions are set into the binding. On the front cover is an ivory plaque of the Tablets of the Law, guarded by the cherubim, here depicted as winged lions. On the back cover, four winged creatures, representing Ezekiel's vision of the Chariot of God, encircle an ivory roundel that portrays Jews praying at the Western Wall, the last standing remnant of the Temple. On the spine, a vertical plaque bears the Hebrew word TaNaKH, the acronym for Torah, Nevi'im, and Ketuvim (Pentateuch, Prophets, and Writings), the three sections of the Hebrew Bible.